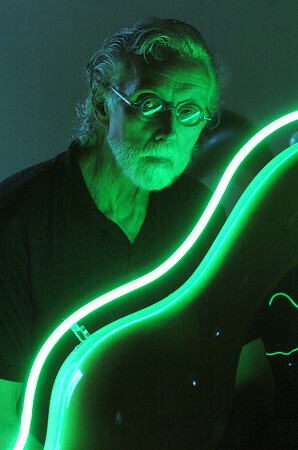 Scottsville, New York artist Wendel Castle poses with his Bunny floor lamp design, circa 1969, made in fiberglass, coated with auto paint and lit with neon. Castle, an american furniture artist and a leading figure in American Craft and is often credited with being the father of the art furniture movement. Also show are the Raquel floor lamp with illuminated spine and the Fat Albert floor lamp. Castle's 41 year old design has become popular among art collectors.